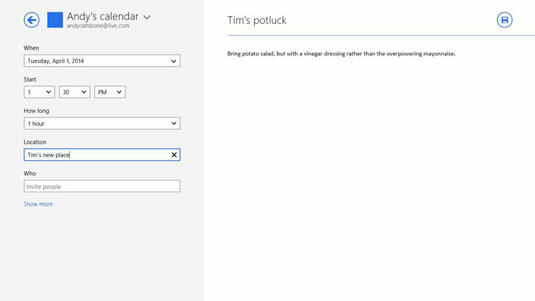 If you manage appointments on your Surface through Outlook.com, you’re in luck: The Windows 8.1 Calendar app harvests that information automatically, just as it does with the People app. The Calendar app also picks up any birthdays it finds on Facebook. Don’t keep your appointments online? Then you need to add them by hand. And even if your appointments are online, you occasionally need to edit old entries, add new ones, or delete ones that conflict with new engagements. Tap the Calendar tile on the Start screen. Open the Apps bar and tap the New icon. Slide your finger up from the screen’s bottom edge to reveal the App bar and its icons, including the New icon for creating new appointments. Fill out the Details form. Most of the choices are pretty easy to figure out: Enter the date, time, duration, location, and a message — notes about what to bring to the potluck. The Calendar app sends your appointment to your online calendar, as well, if you have one. To see your options, tap the downward-pointing arrow next to Calendar in the top right. A menu appears, letting you choose which online calendar should receive the appointment. 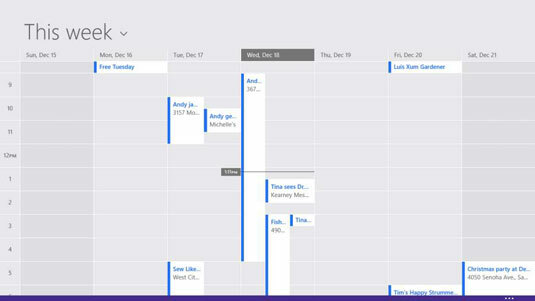 Unfortunately, you won’t see online calendars from Google or Apple; you’re stuck with Microsoft’s Live and Outlook.com calendars, as well as calendars on Exchange, a system used by some businesses. Changed your mind about an appointment? Tap the back arrow in the screen’s top-left corner and then choose Discard Changes from the drop-down menu. The Calendar app adds your new appointment to your Surface’s Calendar, as well as to the calendar of the online account you chose in Step 3. When in use, the Calendar opens to show the view it last displayed, be it day, week, or month. To switch to other views, slide your finger up from the screen’s bottom edge to fetch the App bar. Then, tap one of the buttons: Day, Week, or Month. To delete an appointment, open it from the Calendar. Then tap the Delete button (shown in the margin) in the appointment’s upper-right corner. To edit an appointment, open it with a tap on its entry in the Calendar app. Make your changes and then save your edits with a tap on the Save icon. When browsing the Calendar app, flip through the appointments by flipping your finger across the calendar as if you were paging through a book. Slide your finger to the left to move forward in time; slide it to the right to move backward. To jump immediately to the current date, slide your finger up from the bottom to fetch the App bar and then tap the Today button.